Get 110 illustrations by 55 artists in one big adult coloring book! From animals to sassy quotes, you won’t find a book with greater variety of subjects and styles. Find an illustration you love? Each page shows the artist’s name and book title, so you can find more great books by your favorite artists. Sold at cost! 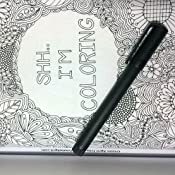 Incredible value for hours and hours of coloring fun! Artist index of short biographies so you can learn more about your favorite coloring book illustrators. So much to color! 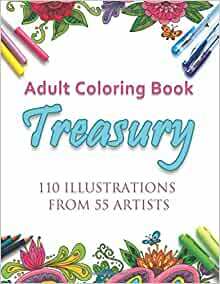 Adult Coloring Book Treasury gives you the opportunity to sample different coloring artists. The 55 artists have showcased some of their finest work in numerous genres including: abstract tangles, anime, botanical flowers, fantasy/sci-fi, people, mandalas (grayscale, tribal, whimsical, black background mandalas), nature and animals, religious (Christian & Jewish), spiritual pages with decorative borders, sassy quotes, symmetrical patterns, vintage, and more! A Big book in size and quality. FANTASTIC! Here we find a variety of pictures (two per artist) that covers all tastes. The main problem is to choose where to start. 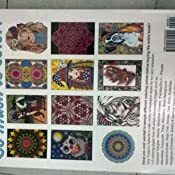 Mandalas, anime, abstract, flowers, fantasy, grayscale, people, tribal, whimsical, dogs, fish, birds, cats, horses, butterflies, religion, sassy, quotes, vintage and so much more... All single-sided in a good white paper. The first book that allows us to keep following the artist ( or artists) we love. Just read the index, their short stories and links or page. What a wonderful idea. I'm already waiting for Treasury II. Seriously. Don't miss this one or you will regret it. 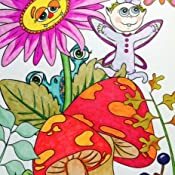 5.0 out of 5 starsGreat value for a fabulous colouring book! 5.0 out of 5 starsFantastic book. Highly recommended! Amazing value for money! Absolutely love this book. The artwork is fantastic and really varied so I can choose a different style to colour in depending on my mood that day. It's a much much thicker book than I expected for the price so it's fantastically great value. The pictures aren't back to back either which is great for me as I prefer colouring with pens, so they don't bleed through and ruin the other pictures. I would highly recommend this book to everyone. Can't recommend this book enough !!! Love it so much. This is a great book for both beginners and colourists who have been colouring for a while. 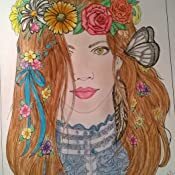 Great selection of pictures, one sided and good quality paper.It gives you the chance to sample the work of 55 artists, so you can then decided if you want to buy more of their work. Great value too !!! have shown some pages I have completed. The only thing that could be improved on this is thicker paper. It's very thin photocopy-like paper. I mean, it's fine because the images are printed single-sided, but thicker would have been nicer to allow the usage of more mediums. If you're using alcohol based markers be sure to put a few sheets of paper (or cardstock) behind the page you're colouring. The artists chosen and the pictures used were all great, though, and it did the job in helping me pick out artists to look into for future colouring adventures, which is exactly why I bought this book in the first place. 5.0 out of 5 starsAbsolutely recomendet. Awesome idea to put 2 designs from a number of artists in 1 book. Cool way to get to know each artist and to find out if one like the individuals style or not. If you can't find anything in this you would like to color, then it certanly isn't the books fault. Very different designs and I would dare to say: Something for every taste in it. Most is very detailed, but some are less so too. 3.0 out of 5 starsAdult colouring book the treasury. There are some nice pictures to colour in but all in all some were ugly and you would not want to colour them in. Only about 5 pages out of one hundred grabbed my attention to be honest.